Today I will be discussing a topic I get so many questions about - Driving with Disability. As most of you know, I make use of a wheelchair for mobility due to a spinal cord injury sustained in a car accident. I feel like I say this a LOT, but I have to mention it before I get asked AGAIN. Lol. Based on some of my VLOGS, a lot of people noticed that I drive and they've asked me how I drive. I get multiple emails on this, so I decided to do a detailed video for everyone interested. I also have more information below on how I got my accessible car. After my car accident, I went back to school, graduated and wanted to begin working after graduation. Being transported by family and friends was fine until it came time to get to work and become more independent. 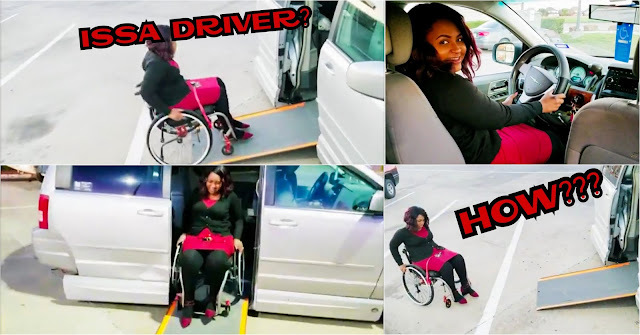 Talking to a friend of mine - Kemi (a wonderful artist) - one thing led to another and she told me about how she has a wheelchair accessible car. I got all the way excited and found out that the state of Texas had many resources (a.k.a FREE Services for those qualified) that could help me get to work after university despite a disability. That was how I found out about DARS (Department of Assistive and Rehabilitative Services). DARS has since taken a new name and is now one of the vocational rehabilitative programs under the Texas Workforce Commission (TWC). With the help of DARS, and my wonderful parents who bought me my car right after university, my car was modified by Lift-Aids and made fully accessible so that I can drive everywhere I wanted to go (especially to work). Lift Aids accessed my abilities and there were a couple of options for a car modifications back then. After much deliberations and considerations for different circumstances (such as when it's raining or if I wanted someone else to drive my car), we settled on this version of modification. Having a car was the icing on the cake of my independence and I couldn't be more grateful to God for everyone he used in making this a possibility. My parents are truly awesome and I know that it was not an easy task to buy me this car for it to be made accessible with the help of the state of Texas and Lift Aids. If you have further questions about this, please ask in the comment section below. No question! You are simply awesome. Thanks for the video, truly all things are possible. Oh I am just very blessed Sandra. Thank you so much. I Praise God indeed. Thanks for your comment. I am so impressed. I also find myself in a wheelchair and I feel all hope is lost. Am very much impressed about you. I am also stucked in a wheelchair and I feel my life is shattered.my dreams are all coming to an end. Hello Benita, please keep hope alive. There's so much more you can still accomplish and your dreams are still very valid. How possible is this please,knowing the part of the world we find ourselves.Africa.